THIS LINK HAS A TRAILER AND ALSO LINKS FOR THEATERS THAT ARE SHOWING THE MOVIE. 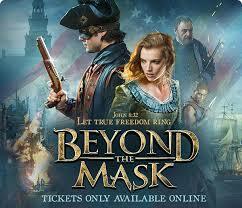 THIS MOVIE WAS MADE BY CHRISTIAN HOMESCHOOLERS AND IS AN ACTION ADVENTURE SET IN REVOLUTIONARY TIMES. IT HAS BEEN SHOWN IN CHURCHES AND NOW WILL BE IN THEATERS ONE WEEK. IT GOT A 94% (AUDIENCE ONLY) RATING FROM ROTTEN TOMATOES. ROTTEN TOMATOES ITSELF HAS NOT RATED IT YET. PLUGGED-IN GIVES IT A 4, BUT THERE ARE A LOT OF SPOILERS IN THE REVIEW, SO BEWARE!